From Monday 17th to Sunday 23th September, from 10 a.m. to 1 p.m. and from 2 p.m. to 6 p.m. In order to pursue the Bruno Boudjelal‘s residence for children from Vergnes district, Fatiha Noura offers embroidery whorkshops. From sophisticated patterns made by children, the aim is to create an embroider frame to go with the photography which will be transfered on a textile support. You can discover or refine your knowledge thanks to this textile workshop. In preparation of the FITE’S public dance which take place on September 22nd, come create your costume from some old useless pieces of clothes. It offers you the chance to discover customisation and stitching skills and explore your creativity. At the heart of the 4th edition of Festival International des Textiles Extraordinaires (FITE), Bargoin Museum hosts the Deviations exhibition which offers an original choice of more than eighty textiles, photographic and videographic artworks, coming from lenders, artists, collectors, public institutions and galleries from all over the world. Four thematics – transgression, circulation, pile-up and transcendence – govern the exhibition and allow to point out society’s stakes, throughout a medium, textile. Among those thematics are tackled many questions, such as standards and non-standards, liberty’s research often linked to the notion of egality, identity within migrations and interbreeding, movements of humans but also of know-how, materials and designs. Artworks of creators from the five continents are inviting the public to a reflection, throughout different forms of expression where textile is at the center of creation. Prices : 5€ full price / 3€ reduced price. The exhibition is free the 15th and the 16th of September on the occasion of the European Days of Heritage & all first Sundays of the month. Guided Tour can be set up on request (subject to availability). Informations and registration through the reception of the museum or by calling this number : 04 73 42 69 70. Prices : entrance price + 4.50 € – Time : around 1 hour – Suitable for all. We advice you to book your guided tour. From Monday 17th of September to Sunday 23th of September, from 10 a.m. to 11 a.m, meetings with artists, artisans, designers. Original creation of Jérémy Gobé, in partnership with Fontanille company from Puy-en-Velay and Isabelle Domart-Coulon, researcher in marine biology MCAM/MNHN, supported by DRAC Auvergne-Rhône-Alpes and Clermont Auvergne Métropole, as part of the residency Art Entreprise, iniated by HS_Projets. From Monday to Saturday from 2 p.m. to 7 p.m. and open Sunday 16th of September on the occasion of the European Days of Heritage and Sunday 23th of September. Friday 21st and saturday 22nd of september from 10 a.m. to 6:30 p.m. Sunday 23rd of september from 9 a.m to 1 p.m. Fabrics, clothes, wires, embroideries, from Mexico, Cambodia, Romania, France and elsewhere. Find the list of all exhibitors at the showroom. Saturday 15th from 2 p.m. to 7 p.m. Opening Saturday 15th September at 6 p.m.
Creations coming from a workshop by Christelle Familiari, focusing on the use of unexpected materials, with art and design students of the École Supérieure d’Art et de Design de Saint-Etienne (ESADSE). Visits by ESADSE students and schools visits on September 15th and 19th and the 20th followed by a meeting on the 1st floor of Metropolitan Tourism Office, in the conference room. By the École supérieure d’arts appliqués (ESAA), La Martinière-Diderot de Lyon and l’École Supérieure Design et Métiers d’Art d’Auvergne (ESDMAA) of Yzeure. September 15th to 29th, from Monday to Saturday from 2 p.m. to 7 p.m. , Sunday 23rd September from 10 a.m. to 5 p.m., closed Monday 24th. Opening Tuesday 18th September at 6 p.m.
Visit par ESAA and ESDMAA students from September 15th to 22th, and the 20th followed by a meeting on the 1st floor of Metropolitan Tourism Office, in the conference room. Friday 21st September from 10 a.m. to 12 a.m. and from 1 p.m. to 5:30 p.m.
By Simon Njami, Béatrice Korc and Christine Athenor. Thursday 20th September at 8:30 p.m.
Romania is the honor guest : fusion between traditional musics and actual music, fruit of the collaboration between Florentin Dragomir (violin), Heiko Wilhelm (accordion) and music ensemble from Music Conservatory, follow by “ichMachKrach!” company and “LosMoz” group. From September 15th to 23rd, from 11 a.m. to 5 p.m. Costumes creation linked with the body, internal, external, deconstructing standards, diverting looks and upset life paths, by students of ENSATT (École Nationale Supérieure des Arts et Techniques du Théâtre) in Costume Conception, second and third years, in partnership with HTH/Bucol. Thurday 20th September, morning, followed by a meeting in the 1st floor of Metropolitan Tourism Office, in conference room. From Wednesday 19th to Friday 21th of September from 11 a.m. to 7 p.m. , Saturday 22nd September from 10 a.m. to 12:30 p.m.
Sunday 16th of September at 4 p.m. and Tuesday 18th at 4 p.m. Sensitive and animated vision of our own monsters, by Nawelle Aïnèche : an animated costume, made up of weave made with videotapes magnetic bands. From September 18th to 23rd – From 11 a.m. to 5 p.m.
Filmed projection of offered gestures to asylum seekers, highlighting everyone’s humanity to share, despite situations, by Anou Skan company, Sophie Tabakov, Laurent Soubise, and Didier Dematons for video realization. Wednesday 19th September at 7 p.m.
From September, Monday 14th to Sunday 23rd, from 8 a.m. to 7 p.m. Textile installation by Rieko Koga, created in 2014, with protective vocations, because for Rieko Koga stitching has a magic power. Renewal of textile’s vision thanks to a collaboration between students, creators, designers and textile companies. With students from La Martinière Diderot, the École supérieur de design et métiers d’art d’Auvergne, the École supérieure d’art et design de Saint-Étienne, the Académie royale des Beaux-Arts de Bruxelles and Macocoï collective. Appointment at Metropolitan Tourism Office at 10 a.m. , visit of school’s installations from 10 a.m. to 12:30 a.m. and round table opened to public from 2 p.m. to 4 p.m.. Transformation et appropriation of the « Wax » of Vlisco company by Students of the Académie Royale des Beaux Arts de Bruxelles Ecole Supérieure d’Arts / ArBA-EsA. 7 designers of textile collective MACOCOI from Bruxelles, gave to everyone the opportunity to divert one of their piece, creating a research space where constraint is an invitation to explore an other aspect of their primary field. Visit by ArBa-Esa students on September 20th, morning, followed by a meeting on the 1st floor of Metropolitan Tourism Office, in the conference room. Saturday 22nd September at 8 p.m.
Saturday 22nd September starting from 8 p.m. Huge hut and tree in wicker basketry made by Thomas Louineau, oyster farmer and basket maker, with children from CHU Estaing. From 6:45 a.m. to 7:30 p.m.
Wednesday 19th and Thursday 20th from 9 a.m. to 12 p.m and from 2 p.m. to 6 p.m. Maximum 8 persons / group, from 12 years old, 85 euros a day and 43 euros half a day per person. Botanical garden offers since the first festival edition to discover plants and fibres and to dye from all over the world. Friday 21st September from 9:30 a.m. to 1 p.m.
Botanical printing on silk scarf with Elisabeth Berthon. Meeting at the Jardin Botanique la Charme for a vegetal gathering for a painting workshop of plants and leafs at Flax textile-café. Every participant create and leave with his scarf. 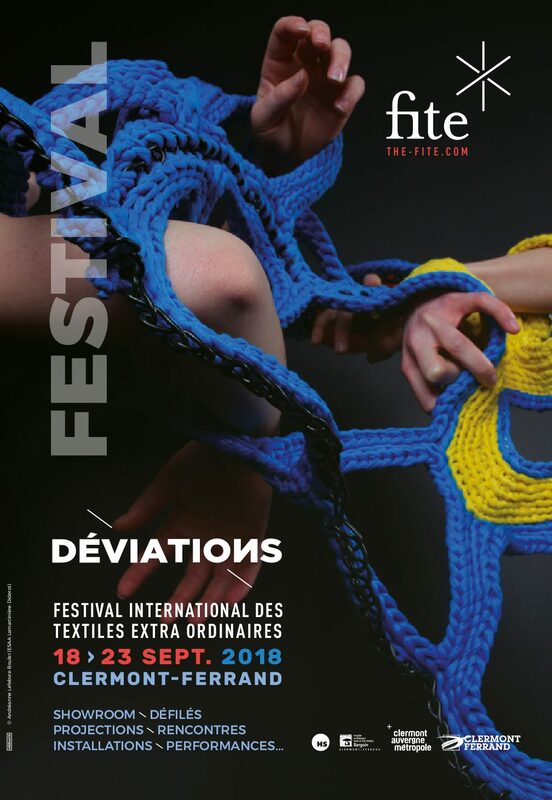 Friday 21st September at 5:30 p.m.
With Elisabeth Berthon, feltmaker artist, Chloé Amarger, cultural mediator of Penitentiary Center of Riom, Samia Messalti, in charge of the insertion workshop Autour du Costume of Clermont-Ferrand. Animated by Nicole Foucher, lecturer mode and cinema and Sarah Momesso, in charge of the festival publication and internet communication. From Monday 18th September to Friday 21st September from 6:30 p.m. to 8 p.m.
Around twenty compositions of images confide by members of the new Assumption Committee and a photograph of a fabric of their choice, by Bruno Boudjelal. Open to public on Thursdays, Wednesdays, and Fridays from 11:30 a.m. to 6 p.m. and Saturdays from 10 a.m. to 4 p.m.
Around ten compositions of images confide by members of the new Assumption Committee and a photograph of a fabric of their choice, by Bruno Boudjelal. Wednesday 19th September at 8 p.m.
« PARCOURS D’AILLEURS DE CLERMONTOIS »34 pictures compositions conferred by Clermont-Ferrand inhabitants, and a photograph of a picture of their choice, evoking places elsewhere, by Bruno Boudjelal.Stops in photo along the tramline. Textile happenings offered by 34 students from the Ecole Supérieure d’Arts Appliqués (ESAA) La Martinière Diderot, Lyon. Collective creation of a textile coral reef, rue du Port, by Paule Kingleur, collective “Outrages de Dames” and Flax, textile café. On September the 19th from 8 a.m. to 10 a.m. and the 22nd from 8:30 a.m. to 10:30 a.m.
Urban printings, print the city on textiles, unusual walk, manhole cover printing rue du Port. Bring your cotton tee-shirts, bags or fabrics at Flax ! Every day, 3 places to discover with curators, artists, designers, fashion designers of the FITE. From September the 17th to 23rd from 10 a.m. to 1 p.m. and from 2 p.m. to 6 p.m.
Group rates (more than 10 persons) : 3,5 euros / person + guided tour package 30 euros by reservation : school groups welcome by reservation. – From romanian textile traditions to contemporary textile art : metamorphosis of raw silk, an exhibition offered by ethnographic museum of Brasov, Romania. – Unique presentation of module Coral / Artefact by Jérémy Gobé in partnership with Fontanille Scop from Puy en Velay, Isabelle Domart-Coulon, ocean scientist MCAM/MNHN – supported by DRAC Auvergne Rhône Alpes and Clermont Auvergne Métropole, as part of Art Entreprise residency iniated by HS_Projets. Opening on July the 11th at 11:30 a.m.